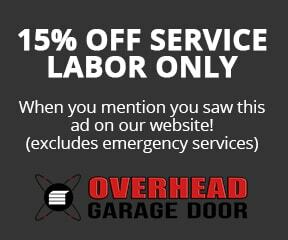 Lincolnshire Garage Door Repair & Installation | Overhead Garage Door Inc. When your garage door is damaged by weather or an accident or stops working due to mechanical problems, it can cast a pall over your property and the surrounding neighborhood. So don’t let the problem fester—call the experts at Overhead Garage Door Inc. Overhead Garage Door Inc. is a certified dealer of Clopay Garage Doors, the industry standard. That means we can offer Lincolnshire customers the very best commercial and residential products, pair them with superior customer service, and deliver exceptional value. We strive to consistently earn our reputation of exceeding your high expectations, and our unflagging mission is to improve the look and value of your home or business. Because of our association with Clopay, we can offer a vast array of styles so you get a garage door that is not only easy to use, but also completely customized to your taste. Our dedicated technicians can install any of the new openers or doors in our product line, thanks to their high level of training and expertise. They also can make your much-needed repairs in a time- and cost-effective manner, which means you can expect total satisfaction. Damage from unpredictable weather conditions, mechanical problems, dents or scratches from an accident—Overhead Garage Door Inc. can take care of any of these concerns and more so that you can once again be the pride of your Lincolnshire neighborhood. Our professional technicians will arrive at your home or business on time, assess the extent of the problem, and review every possible solution with you before issuing an estimate. Need emergency service? No problem. We have technicians standing by 24 hours a day to take your call. Product Lines: Every resident and business owner in Lincolnshire is welcome and encouraged to look over our wide selection of products as listed below. We hope we can help you with all your garage door needs so that you can feel proud of your Lincolnshire home. I know “they” (people who are smart) say never touch the springs on your garage door. Well I must not be one of them because I wanted to give it a try. I can fix anything so I thought… Long story short, I won’t be touching one of those things again. And based on the pinch between my thumb and first finger, I won’t be lifting anything lefty for a while. Overhead Garage if you read this, please thank my tech Nathan for not making fun of me.